EAST LANSING—Michigan State University’s growing expertise in additive manufacturing and high-efficiency power generation has been recognized by the U.S. Department of Energy’s Advanced Research Projects Agency-Energy (ARPA-E) with a new $2.3 million project. It is the third national ARPA-E grant for the Department of Mechanical Engineering in less than six months. Andre Benard, associate professor of mechanical engineering, will serve as lead investigator on HIPPED — Heat-Exchanger Intensification Through Powder Processing and Enhanced Design. The technology features a plate-type heat exchanger that enables lower cost, powder-based advanced manufacturing. 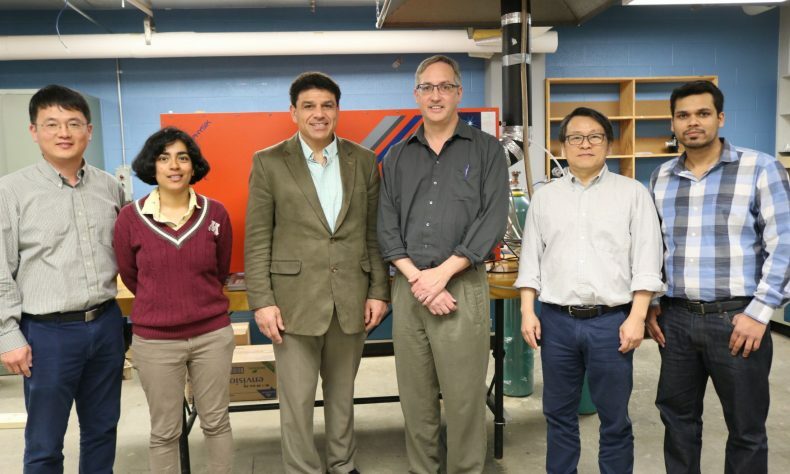 Serving as co-investigators on the project are faculty members from the MSU Department of Mechanical Engineering–James Klausner, Patrick Kwon, Joerg Petrasch, Alex Diaz, Haseung Chung and Himanshu Sahasrabudhe, and Rohini Balachandran from the University of Michigan Department of Mechanical Engineering. MSU Foundation Professor James Klausner, who is chair of mechanical engineering, said MSU has been awarded three grants because of the department’s recognition in energy related issues and the recent hiring of very active faculty members in this field of study. Earlier in 2019, MSU and its partners shared almost $3 million to save energy by developing a freshwater recovery system to extract clean irrigation water from hydraulic fracturing wastewater. In autumn 2018, MSU and its partners received $2 million to develop innovative designs for long-duration storage on the U.S power grid. ARPA-E is part of the U.S. Department of Energy and supports the development of innovative technologies to transform the nation’s energy system. It advances high-potential, high-impact energy technologies that are too early for private-sector investment by encouraging the development of entirely new ways to generate, store, and use energy. Since 2009, it has provided $1.8 billion in research and development. More at https://arpa-e.energy.gov/.